If aliens are coming to Earth, are they visiting Russia? 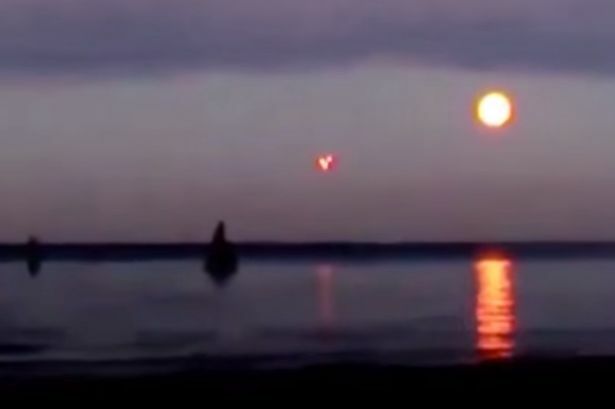 A new video uploaded to YouTube appears to show strange lights in the sky, hovering above the Baltic Sea on Russia's western edge. The 'cluster' of UFOs were filmed at sunset which, according the the video's creator, is the best time to catch UFOs. "When the sun is setting, the light that bends around the cloak will no longer work for a few minutes," wrote Scott C. Waring from ufosightingsdaily.com. "This is why so many are seen during this time of the day," he wrote. In the video, the glowing lights hang in the sky for a period of time, before vanishing - seemingly into thin air. According to the video, which was uploaded to YouTube last week, the sighting took place on August 5, 2015. It's possible that the craft could be the latest top secret Russian military hardware being tested under the steely gaze of premiere Vladimir Putin, or it could just be a few weather balloons out for a casual fly. The video has yet to pick up any comments, but it will likely be well received by UFO enthusiasts monitoring new footage. This is the latest in a number of unexplained videos uploaded to the internet. Earlier this month, a UFO was filmed above LA that bore a resemblance to a certain Ghostbusters character.